I don't know a little girl that hasn't played with Barbie's. I had them as a young girl myself, but can't believe how far they have come. Which leads me to this; Barbie promoting self-expression through music! As you see, I have a family of music lovers. My hubby is self-taught, though he has had lessons on the guitar. My son, is also self-taught. 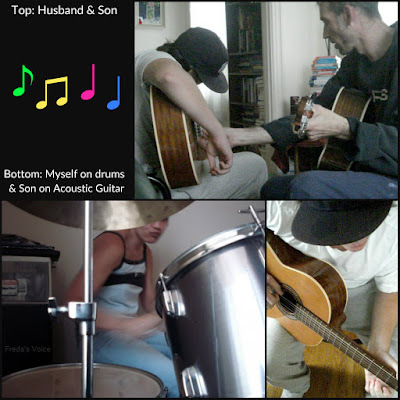 With my hubby's extra guidance, he has become a much better player. Although, he taught himself to play, Smoke On The Water, at age 10! Also pictured is myself. Again, I am self-taught but on the drums. I love keeping rhythm, and especially love the sounds the drums make you blends steady beats together. I truly value teaching children how to play musical instruments when young. In school, in music class, I was a recorder player like most kids. It was probably one of the more easier instruments to play. I hated playing it though and always gravitated toward the piano. Needless to say, while in grade 6, someone actually has me on video tape at school playing, Somewhere Out There, on piano. (Again, self-taught.) When a person, even a child, sets their mind to a task, it can be done. Plus it can be a therapy to some as they get older. Music has helped my hubby, my son, and myself. It lets us create, learn and get away. 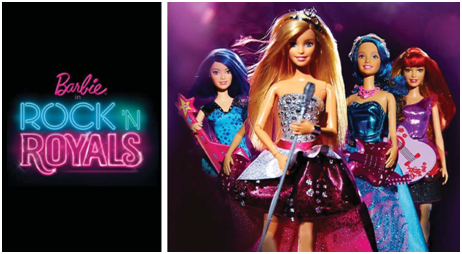 I am so happy to be part of the bunch that gets to promote this new and diverse line, Barbie Rock n' Royals. These musically rockin' Barbies are teaching young minds self-expression through music. You read that right! Many parents encourage their little ones in music through structured music lessons. But for many kids, music lessons can be stressful and monotonous. While following directions and reading music is important for any musician, finding your own beat is just as vital. Encourage your daughter to break the rules once in a while by singing or playing a musical instrument however she pleases. This will give her the opportunity to fully express herself and have fun while doing it! Music is a fun way to empower and express yourself. Making music with your little ones allows you to communicate with each other in a way that words cannot. Music will unlock your feelings, creativity and open the lines of communication. Initiate this with a fun music video singalong in your living room or having a fun family jam session. You never know, you may find that you’re a better singer than you thought! It’s challenging to listen to music without moving to the rhythm! To help get your little ones moving and expressing themselves, try playing a variety of musical styles to inspire them. Dance along with them and encourage them to try new things too. You’ll be surprised where it takes you! Remember that no matter how your little ones chooses to express themselves through music, we all approach music and the arts from a place of creative self-expression that should be encouraged. When we reinforce that there’s no right way, we can all have fun! Barbie is having a fantabulous giveaway on their website. Head over to; http://www.barbie.com/en-ca/besuper/rock-n-royals and enter to win a trip to Los Angeles, California for the Barbie Rock n' Royals concert, featuring a surprise musical guest! Barbie wants to encourage your young one in self-expression with the new Barbie Rock n' Royals DVD. In this upbeat musical, Barbie stars as Princess Courtney, a modern-day princess whose world is flipped upside down when she switches places with Erika, a famous rock star. The two very different worlds collide when a mistake sends Princess Courtney to Camp Pop and Erika to Camp Royalty. While Princess Courtney and Erika learn to adapt to their different camps, they must come together when they find out both camps are at risk of shutting down. Through this process, they find their true voices, and come together for an epic sing-off that shows anything is possible! Celebrating that release, Barbie is offering readers a prize pack containing two dolls and two tickets to a screening in select cities. (ARV $60). Freda's Voice received compensation for posting. Opinions and collage photo are owned by Freda's Voice. Freda's Voice is not responsible for prize shipment, lost, damaged or stolen prizes. Quebec residents do not qualify to enter, all other provinces accepted. I would love to play the piano or guitar. I would like to see the movie calgary. I entered the contest and downloaded the new barbie song too! I used to play the piano, and now my daughter is learning to play. We would see the movie in Surrey. I play the piano, but always wanted to play the guitar. I'd see the movie in Thunder Bay. I entered the contest.I found the games they have on that site. I would see the film in Surrey. I would love to play the drums. I entered the contest. I like the games they have. I played the clarinet for along time as well as the piano. I haven't played and instrument since grade 8.. (Flute) I will leave the instrument playing to my 5yr old. I will be seeing the show in Toronto! I do not play an instrument but would love to be able to play the guitar. I would like to see the show in Surrey, BC. If I could play an instrument it would be guitar. I entered on the site and looked through some of the videos with my kids. I entered! I looked through the great colouring pages, and will download some for my granddaughter! My children are so keen on the film music. They wanna listen them again and again. So great melodies.